Adrian Falkner is building upon 20 years of ongoing success: Under his writer name SMASH137 he has achieved worldwide recognition. 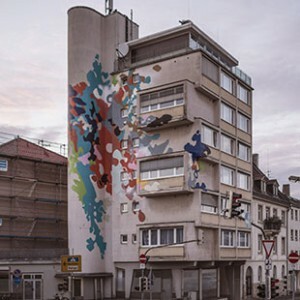 His graffiti can be seen on countless walls and his style is considered to be formative worldwide, as he combines technical precision with an innovative approach to the traditional vocabulary of graffiti writing. Curved lines and open areas, that blend smoothly into one another, along with striking colours characterize his works in the public as well as the distinctive „Cracking“. As one of the pioneers, SMASH137 develops this technique, where a spray can is pierced forcing the colour to be expelled uncontrolledly. Instead of accurately placing lines and areas, quick and steady working becomes inevitable. This dynamic process determines a new rhythm of colours, shapes and forms.